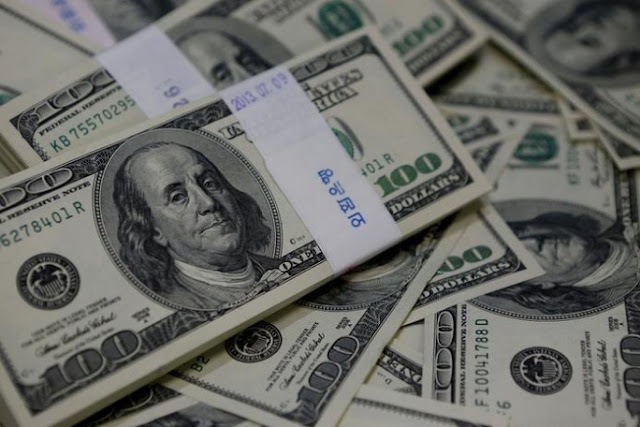 FILE PHOTO: U.S. one hundred dollar bills are seen in this picture illustration. DHAKA - India on Wednesday signed an agreement with Bangladesh extending a $4.5 billion credit line for several infrastructure projects, as New Delhi tries to expand its influence over its smaller neighbour amid rising Chinese competition. The loan, the biggest credit line provided by India to any country, was first announced by Prime Minister Narendra Modi in April and takes India’s total financial support for Dhaka to more than $8 billion over the past six years. China is Bangladesh’s biggest trade partner followed by India and last year pledged around $24 billion in loans for the South Asian nation, which is one of the world’s poorest. Most of the equipment for the Indian-funded projects will have to be bought from India, Bangladesh Finance Minister Abul Maal Abdul Muhith told reporters after the agreement was signed in presence of his Indian counterpart, Arun Jaitley in Dhaka. The projects are targeted for the power, rail, shipping, ports, health and education sectors. The loan, for a total of 17 projects, would be repaid over 20 years at an interest rate of 1 percent. India has long considered Bangladesh as part of its area of influence, and under Prime Minister Modi has boosted economic links with it as well as with other neighbours including Nepal and Sri Lanka. India on Wednesday signed an agreement with Bangladesh extending a $4.5 billion credit line for several infrastructure projects, as New Delhi tries to expand its influence over its smaller neighbour amid rising Chinese competition.